Included below are examples to help you set your BR schedule. Please note that these are not set in stone, but just examples. Please note that you would also need to add days in your schedule to include your extra days for Extension Activities, Earth Day and the EcoChallenge. Also included is a Lesson Schedule Chart that is a handy reference for both you and your teacher. Ideally, this should also be included in your Teacher Manual. 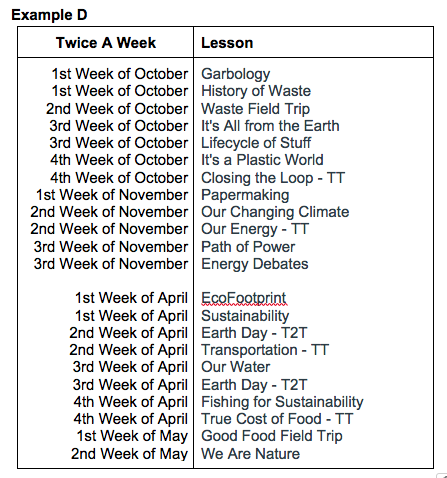 This schedule includes a one lesson Earth Day activity. Note that no lessons are taught on either side of the Christmas holidays as this is an extremely busy time of year. Also, the Real Food Potluck (EcoChallenge Extension Activity) and Good Food Field Trip events are scheduled in the same week. 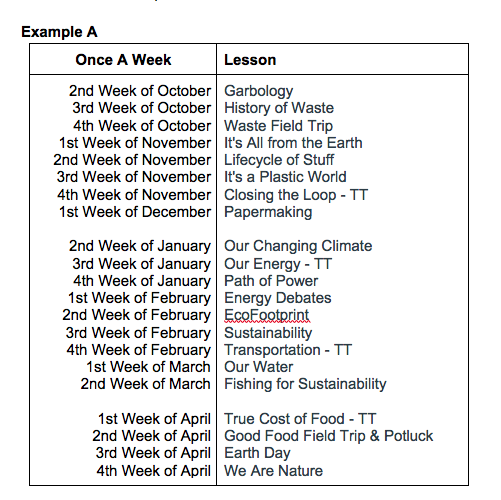 The Example B schedule includes a two-lesson Earth Day activity (Trash 2 Treasure) and the Real Food Potluck (EcoChallenge Extension Activity). 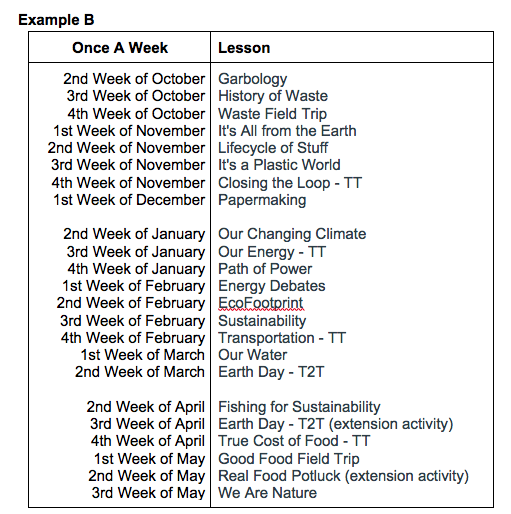 This example has papermaking before the Xmas break, introduces the Earth Day project before spring break, and has one lesson scheduled after the break to give students another reminder before the project is due. 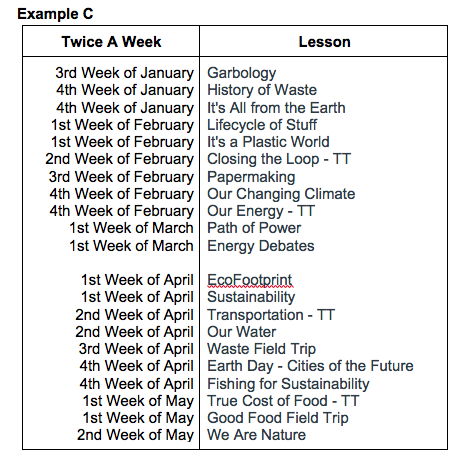 The Example C schedule includes just a one lesson Earth Day activity. The Waste Field Trip is taken at the end of the year in this scenario as it is too cold to visit in the winter when the program starts. In this example, there is only one class during the weeks with bigger lessons or field trips. Also, there is a big break between 2 chunks of BR lesson to allow for the food based lessons to take place in the warmer months.